Two years ago American launched a new program to e-mail non-elite flyers with offers to sell first class seats starting a week before departure. I haven’t heard much about it recently, but JonNYC says that the program is back. AA “Early upgrades” — upgrades offered via email, UP TO a week in advance (that’s when they could be offered, they clear later on), have been re-launched. Offers will be emailed to targeted/selected customers. United is known to sell first class seats cheap to non-elites. They do this while elite frequent flyers remain on the upgrade waitlist and are not given the same buy up option. American Airlines, by contrast, has always been more restrained. American has sold upgrades at check-in to non-elites when they expected all elites requesting upgrades to receive them and they’d still have first class seats left. This has been known as “Load Factor Based Upgrades” (LFBUs). As I understand the program, American is going to market first class upgrades to coach class passengers by email. This communication will happen over email, so American will have to have your email address in the reservation. The method of payment for upgrades will be the credit card used to purchase the ticket. So they’ll need that on file. The ticket will have had to have been purchased by credit card directly with American to be eligible. In theory elite members won’t lose out on first class upgrades because of this program. They offer it selectively on flights where they do not expect first class to go out full. So elite upgrades should happen with first class seats leftover to sell. In practice there will be times that elites lose out to non-elites who take American up on these buy up offers. Since they’re offered before elites have cleared their upgrades, American’s algorithms may be off and more last minute purchases happen. Or irregular operations means that first class fills up more than expected for a flight. If these paid upgrades prove popular American could be tempted to expand them further and trade off with elite upgrades in the future as well. As it is complimentary upgrades are getting harder and harder to get. And airlines are increasingly monetizing those first class seats. This is just another step in that direction, albeit one that shouldn’t have an immediate material affect on AAdvantage elites. Which flights exactly are they going to market these on if they’re only looking for flights that leave with empty first class seats? I’m at EXP in Austin and I’ve flown to all sorts of cities big and small. I remember exactly one flight in the last 100+ I’ve taken on AA that had an empty first class seat. That one was the Chicago to Austin flight last saturday that left with 25 people total. @Gilam – Austin is the fastest growing airport in the country, and American is the second largest player in the market the largest that offers a premium cabin. You don’t see a lot of empty seats up front out of Austin. But if you’re going to see them it will be on a Saturday. Or a Wednesday. And especially the late flights (think 8pm departures) from Chicago, Philadelphia, Charlotte. 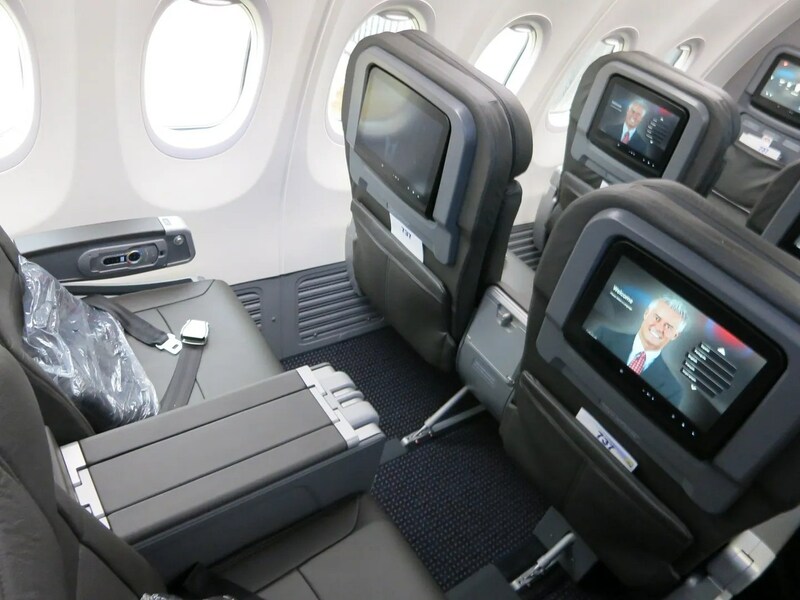 Just as the legacy carriers have re-defined their market position by segmenting into Premium Economy, enough with the massive confusion re comp upgrades, etc. Let’s return to a first class fare that is available to all domestically, given the fact that we acknowledge F has turned to crap over the years. Those who fly 5 days per week have consented how that is their job. Indeed, they are remunerated to spend the extra on F and stop the insanity who has a higher grade of metal to be bumped up free. If AA can sell a F seat for cash by whatever means, sure beats giving it away to so-called elites, so say (but not aloud) their bean-counters. And who could disagree? I tend to fly at very off peak days and times on AA and I never see empty seats in F. There are just so many elites currently. I’m Gold this year, won’t requalify next year, and with my low eqd spend this past year I’m always at the very bottom of the upgrade list. Definitely correct on Austin but I’ve never seen empty seats to and from places like Milwaukee, Indianapolis, etc. and definitely never Seattle, San Francisco, and NY. I’ve also flown out at really odd times and days when I was the only EXP getting on the plane but the first class cabin is still full. They’re going to figure out pretty quickly that their thought process is poor. If the flight is so open that that you can get every elite (even golds) that wants an upgrade into a first class seat and still have open seats up front then odds are no one is going to want to pay what they want to charge to move up. This only makes them money if they start selling these on routes people actually fly like DFW to SFO or AUS to JFK and I’m 100% sure that’s what’s going to happen. Sadly the occasional first class upgrades and the oneworld alliance partners in Asia are the only thing keeping me an AA EXP. Next year might be the time to become a Marco Polo member. I’ll still be able to board 2nd and will get to use the lounge for free.